That hazy, sort of dreamy look to the air? It's humidity. As soon as the heavy dew on the grass had dried Thursday morning, my hunky farmguy Joe hopped on his big new tractor (!!) and cut down a section of the hayfield, which is a mix of orchard grass, fescue, several kinds of clover, some native grasses, and various edible (though not always palatable) weeds because we don't use herbicides. Then he went back out on the little old tractor and fluffed up the cut hay with the tedder. Late Friday morning, after waking up with his back painfully out of whack (from sleeping too soundly! ), he raked the hay into windrows using the old tractor. Once you've cut the hay you're committed, no matter how you might feel. After it had dried in the sun for a while, he baled it up into square bales using the new tractor. Square bales are a lot more work to put up than the big round bales that weigh 500 to 1,500 pounds each, and that almost everybody around here has switched to, but they're much easier to handle. You also end up with a lot less waste when feeding them, and, more importantly, our square bale haying equipment is already paid for. You can see and read more about the whole haying process here, and in A Day in the Hay and In the Circle of Hay. By early evening he was finished baling, so we drove the 16-foot flatbed trailer into the field to pick up the bales. Then we drove to the hay barn in the farmyard, where we unloaded the bales and re-stacked them. Each 40 to 70 pound hay bale is handled four to six times between the field and its final resting place in the barn. This was done in two trips (we usually stack the trailer much higher, but Joe's back wasn't up to it), not including the quick trip Joe had done by himself earlier while he was waiting for the rest of the raked hay to dry more, and I was hiding in my little air-conditioned office blogging and blocking out the next several hours ahead. Since it was nearly dark when we brought the second trailer load in, we quit to do chores (I fed and put the sheep up while he used the air compressor to clean off the baler) and unloaded and stacked it in the barn the next morning. If there had been any chance of rain, we would have worked into the night to finish the job. Been there, done that more than once. This was our second hay cutting of the year. Back on May 9th, Joe did a practice run on a small area near the farmyard to make sure all the freshly greased and prepped equipment was working (only one tire needed replacing!). This was also a test to see how the hay came out when it was cut earlier than usual, with a lot fewer stems and seed heads. Let's just say it's a good thing he didn't cut any more than he did. That lush spot has given us 50 or 60 bales in previous years, and this time it produced only two dozen. It turns out the stems—which the sheep mostly don't eat—help you pick up the rest of the hay when raking and baling. Since this cutting didn't have many stems, at least 25% of it is still laying out on the ground. Part of the low yield may also be due to the fact that, although it should ideally be done every year, we haven't fertilized our fields in a while. The last time we did, it cost a whopping $4,300 to organically fertilize 44 acres (the rest of our land, except for a few neglected acres of pasture too far away to safely graze the sheep, is wooded), which was double what the price had been two years earlier. We're half afraid to even ask what it's up to now. And even spending all that money is no guarantee of lush grass the next growing season, because if it doesn't rain enough soon after fertilizing, it won't end up doing much good. The other day Joe said, "I'd much rather be lamenting the fact that we didn't fertilize last fall than the fact that we did spend all that money and then didn't get any rain." Me, too. We've put up 141 bales of hay so far, but some of that first cutting was fed to our two rams—while they were impatiently waiting in a small pen for their spacious summer quarters to grow up more—because the bales were too wet and heavy and would have ended up molding. Ideally, we'd like to have 900 bales of hay to feed the sheep and donkeys through the winter and into next spring (the longer we can keep the sheep off the growing pastures in spring, the better), so this is just a drop in the big, sweaty, hay making bucket—and doesn't feel like that much of an accomplishment. We don't usually get 900 bales. Whether we end up with that much hay or not this year will depend on the weather, the grass, the functioning state of our antique haying equipment, any unforeseen farm emergencies, and luck. It's a nerve-wracking time of the year. The plan this year is to do more frequent, smaller hay cuttings. It's just the two of us, and after picking up and then stacking 300+ bales in one day—and these would be the hottest, most humid days of the year—it usually takes us several days to recover. And of course this isn't the kind of work you can do in shorts, a tank top, and flip flops. We're covered head to toe out there in heavy jeans, a thick, long-sleeved canvas shirt over a cotton t-shirt, wide-brimmed hat, tough leather gloves, and work boots. The idea behind the new plan is that even though it requires more time dealing with the equipment on Joe's part—taking the mower off the tractor and re-hooking up the baler for each cutting, etc.—putting up just 150 or 200 bales at a time should be easier on us. Of course, right now just the thought of doing all of this five or six more times during the next few weeks is exhausting. But after one day of recovery, we're at it again. Joe cut and teddered another patch yesterday, and he just finished raking it. If all goes well, we'll be back out picking up bales later today. Putting up hay is the hardest, hottest, sweatiest job on the farm. It's also one of the most rewarding—once it's thankfully over. Want to get back in the hay? 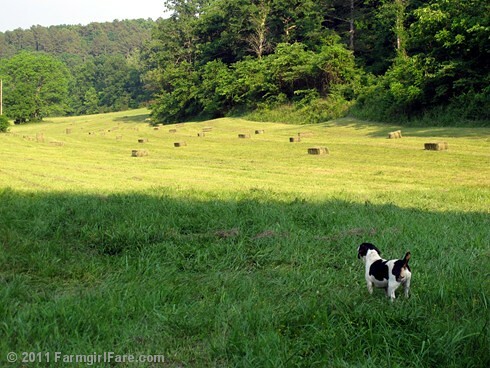 © FarmgirlFare.com, where it's a proven fact that as soon as you head out to handle hay bales, any hint of a lifesaving breeze immediately stops. It would be so nice if haying season could happen in December! We just made a hay field. Had it sprigged on Thursday. Such hard work.....I so admire you, though. The scenery is beautiful and Bert is such a cute helper! Like that Jacuzzi idea. I'm glad we live in the high desert and don't have enough acreage to grow hay! I admire all the hard work you guys do! I was thinking of you this past weekend as we loaded, unloaded, and stacked in the barn a paltry 104 bales of hay. That we just bought and did not have to put up ourselves. Mostly, I was thinking how glad I was I don't have to do this all the time like you do. Stay strong. And hey! Enjoy your NEW TRACTOR! WHEEE!!! Haymaking is quite a different proposition here in Northern California. The grass hay is usually quite thick and has to sit a couple of days after it's cut, then get turned, then sit for another day or two before it's baled. It's been very difficult to do hay this year because it just keeps raining, there's not enough time between storms to get the hay dry. It's going to be expensive in the fall. You guys are great! Here's to good rest, and back at it, and happy backs. Aren't there some swell teenagers in the neighborhood that could be coerced into helping at this time of year? I bet if you offered some of your buttermilk ranch dressing, they'd be so happy, they'd bring the buttermilk! Okay, Susan, I am coming from a position of ignorance here, but I have a question. I live in the country but our place is more mountain-top than field, so we watch hay being put up but I have never done it. My husband has in his distant past, so I should probably ask him, but I'd rather ask you. I had the thought, looking at Hunky Farm Guy carrying the bale to the trailer, "Why not have a heavy, wheeled flat cart, sort of like a Costco cart, that the bales could be lifted onto and then pulled to the trailer?" It seems to my very inexperienced mind that that would at least eliminate carrying the bale across the field. What do you think? I like two of the above ideas: let big strong strapping teenagers help, maybe in exchange for your amazing Farmhouse White Bread, or Emergency Chocolate Cake; and the jaccuzzi. Maybe you could let the temperature drop and cool off in the jets?